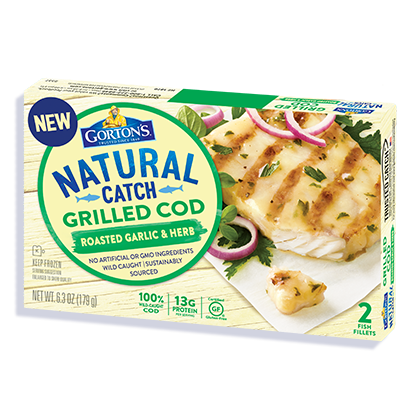 100% wild-caught Grilled Cod Fillets seasoned to perfection. Add a little sizzle to your plate with our perfectly grilled Cod Fillets, seasoned with a delicious blend of garlic and herbs. Made with only the highest quality wild-caught fillets and no artificial ingredients, there’s no better way to treat yourself (and your body, too). 2. Arrange seasoned side up on metal baking pan. 3. Bake for 19-21 minutes*. 2. Microwave 1 fillet on HIGH for 3.5 minutes*, or 2 fillets for 5 minutes*. For lower wattage microwaves, add additional 2 minutes for one fillet and additional 1.5 minutes for two fillets to cook time. Water, canola oil, corn starch, sea salt, garlic powder, spices, dehydrated butter, nonfat milk, whey, parsley, natural flavor.